Most of us have long recognized the wisdom (although we often stubbornly refuse to heed it) of ‘right plant, right place’. Gardening success comes most easily when we choose plants that are suitable for the climate and setting. For Sonoma County, that means selecting plants that can withstand our Mediterranean climate and frequent droughts. Conifer lovers are fortunate, because compared to many other kinds of plants, in general, evergreen conifers are well prepared to deal with adverse conditions. These ancient plants evolved during a time of great climatic change in the world and consequently have dealt with conditions far more extreme than we are facing today. They are wind-pollinated, hence are not affected by any asynchronicity between themselves and insects that might arise from drought or temperature fluctuations. They also can conserve nutrients by not being forced to produce a new set of leaves every year. They can photosynthesize if conditions are harsh and prevent—or delay—new growth. Because they are always ‘in leaf’, they can photosynthesize whenever conditions are right—they don’t have to wait for bud break. This also means that they can take advantage of irregular rainfall, even if it is outside of the normal growing season. The first place to look, when seeking conifers that will do well in our gardens, is in our California native plant population. These conifers, such as Pinus contorta, Sequoia sempervirens, Pseudotsuga menziesii and Cupressus macrocarpa, have evolved to deal with the specific conditions of the area, so should work best in our gardens, right? In California alone there are over 50 native conifers, about half of which have more garden-appropriate cultivars. 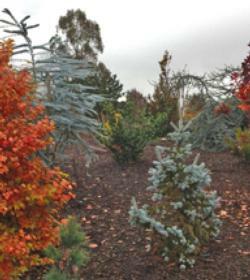 Some of the darlings of conifer collectors are amongst these plants: Pinus contorta ‘Chief Joseph’ and ‘Taylor’s Sunburst’ and Picea engelmannii, ‘Bush’s Lace’ and ‘Blue Harbor’. Where it gets tricky is that California is a big state, with coastal, mountainous and desert regions. Sequoia sempervirens, for example, is only truly happy in a narrow band practically within sight of the Pacific, and Picea engelmannii prefers the moist slopes of the Klamath Ranges. 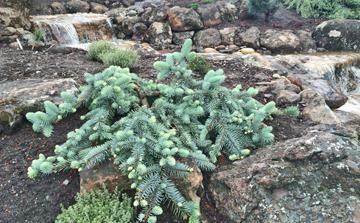 I grow cultivars of all of these species here in my garden, but I wouldn’t classify them as ‘low water’ conifers. Going native sounds good, but doesn’t always produce the best choices. When seeking natives, focus on those that can handle the specific extreme to which you will be subjecting them. Cupressus macrocarpa (Monterey cypress), for example, withstands low rainfall, poor soils and Pacific gales, so is an appropriate California native conifer for low-water situations. The ‘Lone Cypress’ of the Pebble Beach golf course is a Cupressus macrocarpa and is estimated to be 250 years old and has survived not just wind and low rainfall but fire. Now there is a tough plant! The garden cultivars are lovely, with ‘Coneybearii Aurea’ and ‘Greenstead Magnificent’ among my very favorite of all of my plants. Even better than many natives, the conifers that truly seem to deal with the dry summers and extended periods between waterings are those that are native to regions with extreme conditions. The Mediterranean conifers, for example, are naturally equipped to handle less-frequent waterings. Abies pinsapo, or Spanish fir, (with some great cultivars such as ‘Horstmann’, ‘Glauca’ and ‘Aurea’) and cultivars of some of the cedars, such as Cedrus libani and Cedrus atlantica, are standout performers in my garden. Once established, they can handle much less-frequent waterings than Sequoia sempervirens. There is a wide range of size, color and form amongst the cedar cultivars, so you can have a lot of variety within this one genus. believed to reduce their temperature, as well as transpiration and light absorption. That protective wax helps Colorado blue spruces retain moisture and deal with low-water conditions. Once established, Picea pungens cultivars are some of the summer-hardiest conifers in my garden. Pinus mugo hails from mountainous regions of Europe and Asia, many of which suffer severe, desiccating winds. Consequently, mugos have developed tough needles to retard water loss, enabling them to handle our dry summers. They have an exceptionally large native range, which yields the longest list of synonyms of any pine and a dizzying array of variation among the cultivars. Some, such as ‘Mops’, ‘Sherwood Compact’, ‘Slowmound’ and ‘White Bud’ are reliably slow growing, so if you select one of these, you will avoid the dreaded guessing game of wondering how fast (and how large) your mugo will grow. Junipers as a genus are generally regarded as drought-tolerant and their wide distribution in the wild covers many arid areas. We have native Juniperus in rocky, dry areas in California and there are others endemic to the Mediterranean, North Africa and other desert or quasi-desert locations. There are hundreds of juniper cultivars and almost all of the ones available in the trade can handle low-water conditions. (Junipers have the added advantage of often being more reasonably priced than other genera; they do not command the respect of most other conifers.) Likewise, Ginkgo biloba (while not a conifer, is a gymnosperm and under the ACS umbrella) is drought-tolerant and withstands poor conditions. certain genera are much more widely represented, with Pinus itself the most frequently occurring genus. While there are a few firs and spruce that do extremely well in drought conditions, there are far more that would languish, if not die outright. Most importantly, there is an enormous difference between the water needs of a newly planted conifer and one that has an established root system. When I say that a conifer is drought-tolerant, that always means once established. It generally seems to require at least 2-3 years for conifers to develop large enough root systems to deal with less-than-ideal watering. Also, even for species that prefer full sun, providing a bit of afternoon shade helps their ability to conserve water and retain their good looks. I do water overhead 1-2 times per summer to provide a good soaking and flush off dust. 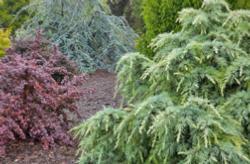 Really established mature conifer trees can get by with much less than a weekly watering. The Sequoia sempervirens that were planted by our predecessor and are over 40’ tall, for example, get no supplemental water at all, and they are further inland than their ideal situation. I water full sized trees once a month at most. This article first appeared in longer form in the journal of the American Conifer Society, the Conifer Quarterly. For more information about conifers, see www.conifersociety.org. Master Gardener Sara Malone is also ACS website editor.